Vue Cinemas are looking for their next People’s Pundit for Family: Could you be their next film critic? The search is now on and it's very easy to enter. All the information you will need to know is right here online at VUE but let me explain a little about how it's all going to work. Vue are looking for someone who's maybe a big kid at heart or just really good with words. They want someone who's going to be able to tweet a film review in just 1 tweet, that's just 140 characters which is pretty tough. 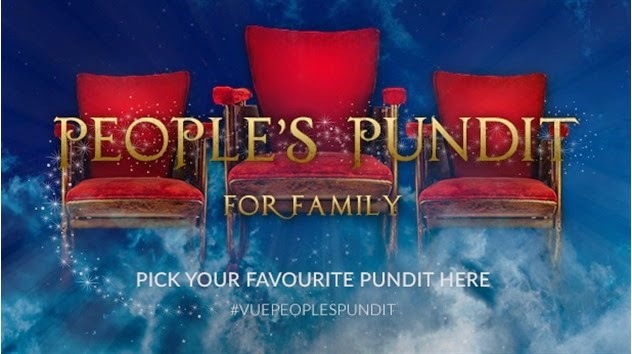 If you'd like to be their People’s Pundit for Family, then all you need to do is head over to Twitter and tweet them ( @vuecinemas ) a review of your favourite family film using the hashtag #vuepeoplespundit. You'll need to be a super-sharp writer and make each and every word count as you'll of course only have 140 characters – Do you think you can rise to the challenge? I know that I am definitely going to have a go! You have until Friday 20th March to dazzle them with your reviews, after which they will select their favourite 25 finalists who will then get to attend a screening of the forthcoming Disney epic Cinderella which in itself is a great prize for the final 25. After the screening, the 25 finalists will submit their reviews of the film and then all go onto a new and improved social voting app where the person with the most votes will reign supreme. (I'm not a fan of voting competitions myself but I have been reassured that the voting process will be monitored very carefully to make sure vote buyers or cheats don't spoil it for others. I'm happy to take in part in which case). The winner will not only receive a review spot on their blog, but a Gold Vue cinema pass which entitles the winner plus a lucky friend to see a limitless amount of films for 12 months. The Terms and Conditions: Please do read them. Entrants must use #VuePeoplesPundit to enter with their review of their favourite family movie. The closing date for entries is 23:59 Wednesday 18th March. On Thursday the 19th March we will collect 25 of our favourite entries and invite them to their local screenings of Cinderella at Vue. After the screening, you can vote for your favourite review via the Vue website. Reviewers will then have until 23:59 Tuesday 21st April 2015 to collect as many votes as possible. The reviewer with the most votes will win and become Vue’s official Family film critic and be awarded with a 12 month Vue guest pass.